When it comes to soil stabilization and void filling, I get a lot of calls to help local contractors. Recently I was advising LJS Waterproofing on a structure that had issues with unstable floors. I instructed them to use the technique of probe grouting. 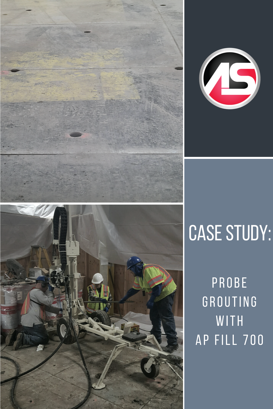 They inserted the grout pipes about 22 feet in the ground. Next, they began to pull the probes out of the ground while pumping about 2 gallons of AP Fill 700 every foot. This was done 5 times until they reached the 17 foot marker. After the grouting was complete, the damaged floors were removed and replaced. This time around the floors should have a longer lifespan since they are supported by solid, stable soil.